Our Live Experimental Interactive Television class is coming to a close. All four of our episodes have now aired on the Manhattan Neighborhood Network. It’s made for a busy but fun couple of weeks. Above are some of the highlights from our two episodes of UNITV. You can also check out some behind the scenes footage on my flickr page and check out the project in the ITP Spring Show. For last week’s class we were asked to build a web interface to allow viewers to interactive with a 5 minute live program. 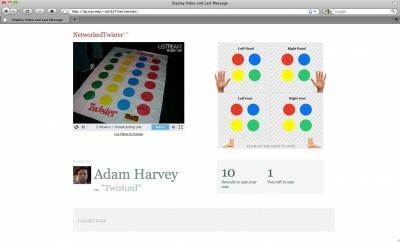 Working with Adam Harvey and Si Heun Cho, we created a networked version of twister. The game streams live through ustream.tv and replaces the wheel that usually decides players moves with an interface that allows viewers to vote on the next move. The counter resets after every move and voting opens back up. One of the things that works well in this respect is the number of options for voting. It creates a greater sense of impact for voters. At the same time though, this impact diminishes as the scale of the viewership increases. The game seems as though it would only work well on a smaller scale (say under 50 people) and even better with a viewership that has some sort of relationship with or prior knowledge of the players. One of the other strengths of this type of idea is the sense of control it creates. Although shared amongst the collective viewership, the concept of controlling something on the screen as an extension of what a remote normally allows seems to bridge the gap between performer and audience. If we were to try this again, I think it would be interesting to try a different game and see how the dynamic changes. With this version, there is a tendency to vote for the most awkward move or for whatever move would help whoever you are hoping will win. Instead, an interesting way of changing the dynamic could be choosing a game where the audience doesn’t control the competitors, but instead competes against them. Last week in Live Experimental Interactive Television we were asked to create a site where users were able to interact with video by SMS. Teaming up with Adam Harvey, Edward Gordon and Mustafa Bagdatli we created the above video. Drawing upon the ridiculousness of the Daft Bodies meme, we thought it would be funny to give users the ability to control the characters with their phones. One of the things I thought worked well was the ability to send in a word via text and see that word acted out and sung with the typical Daft Punk vocoder sound. One of the drawbacks would be scale. It worked well with a class room full of people, but it might get out of control with thousands of viewers. A few ways to approach this problem may be to change the nature of the content, divide up the screen and then provide many more options. If this was the case, you could construct some sort of game based goal which people may be able to see the result of their actions clearer. While watching the Superbowl over the weekend, we were asked to look around for sites set up to act as a second screen to watch the game. The variety of options I came across were surprisingly slim. I went to all of the major sites I could think of (NFL, ESPN, CBS, NBC, Sports Illustrated, New York Times, etc.) and found many of the same results. Most sites would have a combination of: a chat room, a visualization of the play by plays, a blog, a photo blog, trivia and a few other similar options. The site that seemed to have the more interesting set up was actually TSN. They were using Facebook Connect to allow users to sign in and compete in games against their friends and/or the rest of the users on the site. Polls were constantly being added and users would vote on each to earn points. They would cover all sorts of questions, from who would get the next touch down to how many yards would be gained on the next play. Each option rewarding the correct answer a varying number of points. As the game went on and point tallies rose, prizes were offered to whoever finished on top. The interesting thing I found about this game was the social aspect of it. Another observation I had was that Twitter and Facebook were sort of loosely organized second screens in themselves. All of these options seemed to me more successful in the respect that people would rather read what their friends have to say about the game than strangers (or even respected bloggers in many instances). For Live Experimental Interactive Television (LEIT) class this week we were asked to watch a live television broadcast and think of ways that it can be made interactive. This worked well with my plans of getting to watch one of the few Pittsburgh Penguins hockey games that are televised here. As far as adding interactivity in to this type of programming a few things came to mind. One is that during intermission there is often a player or two that is interviewed. Often that is dictated by their play (someone scores a goal that period). An alternative to this system, could be for users to send in SMS messages voting for who they would like to hear from during intermission. Away from the television and moving on to the computer screen, I thought it could be interesting if the camera selections or commentary could be influenced by keywords that occur in conversation amongst a chat room embedded into the site displaying the game. Those are just a few thoughts so far, but it will be interesting to shift to this frame of mind in the future and continue to think of more.